HOW TO MAKE SHRIMP RISOTTO IN JUST 13 EASY STEPS! 1) sautee the shallot and fennel in olive oil and butter and salt until nice and soft. Clean the shrimp while you wait. Also make dinner for the kids and pour some whiskey. Put a box of pre-bought seafood stock [DO NOT JUDGE ME] on to warm up. 2) Throw in some garlic. Mmmm, smells like garlic. It takes a minute. 3) pour in the rice and stir it until it sounds like you've got rocks in there. That means it's absorbed the oil. Probably 2 minutes but I lost track of time because we were decorating for Halloween. Anyway, it sounds crunchy. 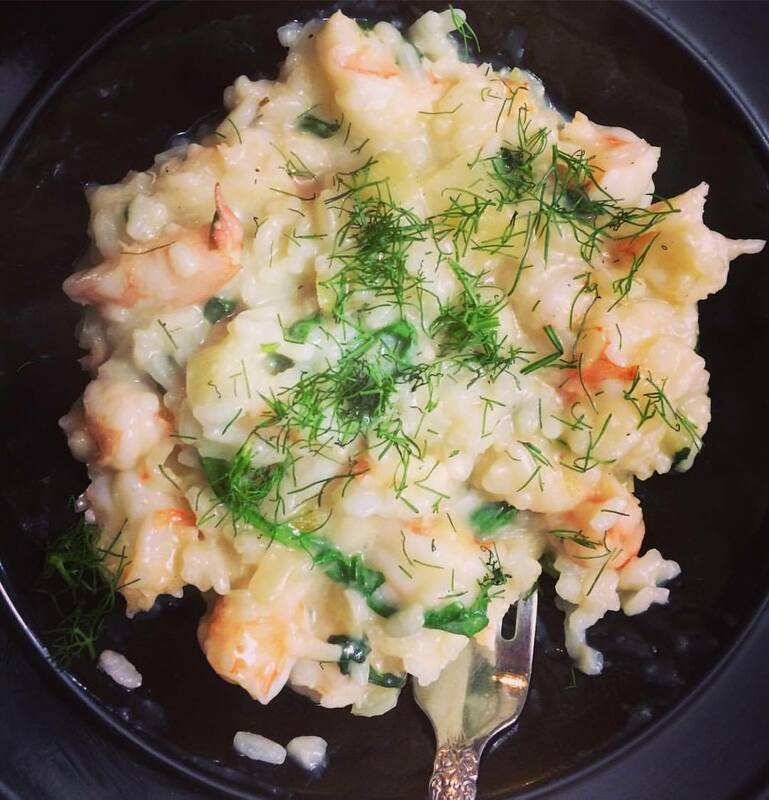 Description: A bowl of risotto, shrimp, and fennel in a black bowl. 4) Add, I dunno, a cup of wine per cup of rice. Cook down. Stir a lot.. shrimp and save the shells and tails, then put on with some water to serve as shrimpy backup. You should have done this yesterday and made actual shrimp stock, but you don't have a time machine, so it is what it is. Don't use too big a pan as you'll just need a few cups and want to get shrimp flavor in fast. 5) Figure out what the kids are eating cause they ain't eating this. 6) Hey my wife bought a nice Italian cheese. I should eat some of that. 7) Add the seafood stock a few ladles at the time. Stir regularly. Not too regularly. Keep cleaning shrimp. Eat more cheese. Drink whiskey. 8) When the seafood stock runs out, use some of the shrimpy water. 9) When it's almost done, add some lemon juice, black pepper, and salt. Taste a lot. Have my wife taste too as her palate is better than mine. 10) Then throw in arugula and stir until it wilts. Chop the shrimp. Toss in a bit more shrimp water. 11) Check with wife if we are adding parmigiana even though it's shrimp. We are. Parm adds depth and salt. We're not actually Italian. Add parm. 12) Add chopped shrimp and cook until just done, maybe 2-3 minutes. 13) Then serve and top with fennel fronds. On the day after the deadliest mass shooting in modern United States history, White House Press Secretary Sarah Sanders responded to questions about gun control legislation by telling reporters that "there will certainly be a time for that policy discussion to take place, but that's not the place that we're in at this moment." If there is a "place" and "moment," are we there yet? And if not now, when? In the weeks since a gunman fired more than 900 rounds into a crowd of concert-goers, killing 58 and leaving over 500 more wounded, we've re-learned the key lesson about reducing gun violence in America: We still can't do it. To be clear, the right wing is perfectly willing to use violence to make a political point, but only when it allows them to dehumanize already vulnerable people. Sanders, for example, concluded that press conference by talking about Chicago—which is to say gun violence among black people in Chicago. (In the interest of fact-checking: Chicago's gun laws fail because right-wing states like Indiana and Missouri allow individuals to purchase weapons and traffic them into the city.) Speaker of the House Paul Ryan always responds to questions about gun violence by talking about mental health. And people with unmet mental-health support needs are vastly more likely to be victims of violence than perpetrators of it. Sanders, Ryan, and their partisans are uninterested in such details, of course, because the goal is to derail the conversation onto any topic except how to keep killers from getting powerful guns. A guest post by Monica H. Green. Dr. Green is Professor of History at Arizona State University. I see dead people. That’s my job. I’m a historian. But in the past five years, I have seen many millions more dead people than I ever thought I would as a historian of medicine. In the past five years, I have had the experience of slowly realizing that the Black Death—the massive outbreak of plague that struck in the middle of the 14th century—likely affected many millions more people than we ever imagined in our wildest nightmares. In most of the maps we see when we study this period of history, in most of the texts we read, we are usually taught to think of the Black Death as a pandemic that struck only the Mediterranean and Europe. We teach the Black Death through the stories of Boccaccio, telling us of social breakdown from the perspective of elite Florentines who could afford to escape the city, leaving others to their fate. We learn of the Black Death from manorial records in England, which show tenant after tenant having to pay the heriot, a kind of death tax, in order to inherit land from their deceased relatives. We cringe with horror listening to Ibn al-Wardi, writing from Aleppo, recount the terrifying progression of the plague across the Middle East and into North Africa. But what we haven’t seen or heard, what we haven’t previously perceived, are the many millions of people beyond the Mediterranean who may have also been struck by the disease. Geneticists now talk of a “Big Bang” in plague’s history, a sudden branching out, an explosive expansion of the causative organism of plague, Yersinia pestis, sometime in the late 13th or early 14th century. This expansion of plague created four new branches in plague’s evolutionary tree. One “branch” went westward, reaching the Black Sea and then the Mediterranean. Two branches likely stayed fairly local in central Eurasia, and may have affected wild animal populations more than humans. Minimum spanning phylogenetic tree of 133 Y. pestis genomes, with major historical events marked. From Y. Cui et al. 2013, fig. 1A, with additions by M. H. Green. Reproduced with permission. But the fourth branch spread out just as widely as the first. Strains called by scientists 2.MED and 2.ANT can now be found across almost all of Eurasia, from Jilin Province in northeast China to Turkey and even Algeria, from Russia and Mongolia to Tibet and India. Perhaps as much as two-thirds of Eurasia, and maybe even major parts of Africa, were affected by this pandemic, which spawned continuing outbreaks for centuries. How do we know this? Because strains of plague initially created in the 14th century still exist in the world today. The evolutionary history that I have just given has been made possible by the fact that this organism still persists on four of the five inhabited continents of the world. Plague outbreaks are not a routine experience for most of us today, but that is not because we ever “conquered” the disease. Plague has never been eradicated, and it won’t be. Rather, we have established an uneasy détente with the organism. We know where it lives, we know how it behaves. And we watch it. Closely. And that’s why those of us who know plague are watching the situation currently unfolding in Madagascar with increasing alarm. The current toll of 1192 cases and 124 deaths already makes this one of the largest outbreaks in years. Equally alarming is the fact that, of the 22 administrative districts in Madagascar, 14—two-thirds—are reporting cases. This is a plague outbreak out of control. Why is Madagascar suffering from this “medieval” disease? Because it’s part of the modern world. I live in “medieval” Arizona, a state—like most of the American West—where plague has also insinuated its way into the wild rodent population. Plague arrived in Madagascar and the American Pacific coast about the same time, around 1900, and for the same reason: it was being transported all over the world in the holds of steamships coming out of Hong Kong’s harbor. In both Madagascar and America, it spread inland, finding new hosts and taking up permanent residence. Plague has changed very little in the past 700 years. It hasn’t had to. We control plague nowadays by using insecticides to get rid of the fleas that transmit the disease from host to host and by controlling rodent infestations. But plague never went away. Only our daily awareness of it did. What is happening in Madagascar shouldn’t be happening. We know how to monitor this terrifying disease and we know how to control it. We know that a standard arsenal of antibiotics can halt an infection, if it is given very quickly after exposure. We also know that, if not controlled, plague has one of the highest mortality rates of any disease in history. What we have not yet learned is a lesson the microbial world has been trying to teach us since the 14th century: we’re all connected. Madagascar is suffering now not because it is trapped in its medieval past. Madagascar was indeed connected to a larger world in the Middle Ages, but we have no evidence that plague reached it then. Rather, Madagascar is suffering from plague now because of its connections to the modern global economy. The mining, the textile production, even the very vanilla we use everyday has made Madagascar part of this global economy. I see dead people in the past. And I cannot save them except by recovering their stories. The people of present-day Madagascar, however, are not beyond our reach. Or beyond our responsibility. We are all connected. I was writing a piece today about gun violence when news broke that the FBI was releasing 1500+ pages of documents about Sandy Hook. They are available here. Experts in the case say there's nothing especially new here, but I haven't read them all before. Two things remain clear. 1) There were lots of warning signs and missed opportunities for interventions of all sorts. 2) Without the guns, especially the AR-15 Bushmaster, a lot of kids would still be alive. One of the great joys of living in Chicago was getting to know Ada Palmer, brilliant historian and speculative fiction novelist. I was privileged to interview her at her last two book launches in Chicago (one of which I subsequently published some of). Last August, she received the Campbell award for best new writer at Worldcon, a major prize indeed, and mounted the stage with a cane and delivered a speech about invisible disability, on which she then expanded at length in this blog post. I had not discussed this in public before because being public about disability (especially for women) so often results in attacks from the uglier sides of the internet, a dangerous extra stress while I’m working hard to manage my symptoms. I have been open about my disability with my students and colleagues at the University of Chicago, every one of whom has been nothing but outstandingly supportive. In fact, much of the strength which helped me get through last night came from the earlier experience of discussing my disability with my students this past year when I had to explain that I might miss class for surgery. Their outpouring of warmth and support was truly beautiful, but I was also awed by how eager they were to discuss the larger issue of invisible disability, and to hear about how I’ve worked to balance my projects and career with my medical realities, a type of challenge which affects so many of us, and many of them. Thinking of their kindness helped me keep my courage up last night, when having an attack at such a public moment made it impossible to avoid having this same conversation in a much more public and therefore scary space. I have been given screenshots of a letter which I transcribe below. My read is that this is an improvement on the letter from the PR folks, which did not specifically address the issue of right-wing targeting. We want to acknowledge your concerns about recent developments. Please know we stand in firm support of our teaching assistants. We fully recognize, respect and encourage many of the innovative pedagogic methods designed to encourage the participation of marginalized students. We also deplore the ways that social media has been used to target those who seek to further this mission. While we cannot comment further at this time, we are cognizant of our responsibility to make all students feel welcome and included in our classrooms. We remain deeply committed to realizing these goals together. We hope to have the chance to meet and hear your concerns in the coming weeks. The document is signed by the Director of Graduate Studies for History, the Associate Dean of Graduate Studies, and the Chair of the Department of History. Last week various historians came to D.C. to talk about the alt-right and their use of crusade iconography. Eventually, various alt right social media accounts became aware of the event and its hashtag, #altcrusade17, and started tweeting violent memes out. Thus proving the point. WBEZ has a breathtaking scoop about CPS hiring auditors, some of whom billed as high as $350 an hour, with no background in special education, to reshape CPS special ed! The results have been disastrous. 1) Declare CPS is broke. 2) Declare Special Ed is too expensive, especially for black and Latinx boys. 5) Create new systems to make it harder and harder for kids to get benefits. 6) Declare victory, I guess. In an interview with WBEZ, CPS officials involved with the special education overhaul said if students were denied services, it was because they didn’t qualify under the new criteria. Yolanda Williams’ daughter was one of thousands of students affected. She has Down syndrome and had qualified for occupational therapy for years, Williams said. But last year the staff at Penn Elementary in North Lawndale suddenly stopped providing it to her, she said. Williams’ daughter sees an occupational therapist outside of school at the University of Illinois-Chicago. That therapist says the girl still needs the extra help at school, Williams said. “I am trying to understand what happened and why?” she said. The UIC therapist is teaching her daughter life skills such as brushing her teeth and tying her shoes, Williams said. But she said her daughter’s handwriting is virtually unreadable and she doesn’t know how to read, which are skills an in-school occupational therapist could work on. CPS has always depended on some parents not knowing their rights. Now they have made it worse. We don't know how many people the police kill every year and the government, writ largely, doesn't care. Over half of all police killings in 2015 were wrongly classified as not having been the result of interactions with officers, a new Harvard study based on Guardian data has found. The finding is just the latest to show government databases seriously undercounting the number of people killed by police. Historians are receiving a weird email asking for their views on objectivity. Is this a right-wing trawl or a desperate student? It has never been more important for academics to speak, to write, to engage, and to push. I actually don't think it was less important a year ago, 5 years ago, 15 years ago, and so forth. It's always critical. But the rise of Trump mandates regular public engagement, while also elevating the risks of backlash. So be careful out there. Write, tweet, talk, teach as if your words are being tracked by people who want to destroy you. But also write, tweet, talk, listen, and teach as if your words can make a difference guiding us through what I believe will be a difficult slice of American and global history. I spoke to Canadian Broadcasting about Nazis and medievalism. There's a text article. And the actual interview segment. There is no de-escalation training that can build better policing. There is no video monitoring that can hold police accountable. So long as cops can say, "I was afraid," even when video evidence shows that they are lying, they are legally entitled to commit murder. Patrick Harmon, a black man with, according to his sister, psychiatric disabilities, was pulled over for biking without a light. As the encounter escalated, he ran away and the police shot him in the back. Later, they said it was a terrifying encounter ... but video demonstrates that this was not the case. No weapon, no threats, just a scared man being non-compliant. There is no reason to expect justice here, because our system doesn't promote justice. It promotes compliance. Do not share the video. No one needs to watch it. We know what it shows. The GOP plan is to blame mental illness instead of guns for gun violence ... while doing everything to end access to mental healthcare. I wrote for CNN. On Tuesday morning, House Speaker Paul Ryan made his first remarks about the mass shooting in Las Vegas. He said nothing about guns, but traded easily in false stereotypes linking mental illness with mass murder. He said that "one of the things we've learned from these shootings is often underneath this is a diagnosis of mental illness." He touted the 21st Century Cures Act, which passed with wide bipartisan support in the waning days of the Obama administration. Let's be clear. Only 3% to 5% of all violent crimes involve people with psychiatric disabilities, including conditions such as schizophrenia or bipolar disorder. People with such conditions make up more than 18% of the American population. These individuals are 10 times more likely to be victims of violence than those without mental illness. Talking about mental illness, whether it's relevant or not in a given case -- and it is often not -- is an attempt to dodge talking about guns. It's long since time to separate conversations about mental health and gun violence. Since President Donald Trump took office, every Republican attempt to replace Obamacare has proposed stripping away community and medical supports from people with mental health needs. If the GOP has its way on health care, insurance companies would have the right to raise premiums and potentially even deny care based on pre-existing conditions. People with mental health needs would either have to hide their conditions or go broke trying to pay for care. READ THE WHOLE THING PLEASE. This story, amidst so much horror, has not gotten widespread coverage outside the disability rights world. Temple officers responded to a disturbance complaint around 7:30 p.m. Thursday near an apartment complex. They encountered Gayle, believing he was responsible for the disturbance, and said he was uncooperative and appeared intoxicated, according to a police release. During a struggle, the officers tried to handcuff Gayle and put him inside a police car, police said. The Temple Daily Telegram reports that Gayle's family and people who witnessed the incident are questioning the account police have given. Witnesses who spoke to the newspaper said the officers, who were white, used excessive force to arrest Gayle, who was black. Some of the witnesses told the newspaper they saw an officer place a knee in the man's back and punch him in the face while he was on the ground. According to the newspaper, Gayle's sister, Tiffany Nuckols, said he had an intellectual disability and sickle cell anemia. She also said he suffered from nerve pain in his legs that caused them to lock up and kick sometimes. I feel the need to note that Gayle was not, in fact, responsible for the disturbance. He was just in a non-compliant body watching kids play football near by, so police decided to go for him. Then he responded in non-compliant ways, so they escalated. Then he died. I feel the need to note that his connection to the "disturbance" is, in fact, immaterial. His death would be an outrage either way. "At the heart [of the field] is a saying that became common in the 1970s: There's no such thing as a natural disaster. There are hazards, some of which are natural (earthquakes, tornadoes, river floods) and some of which aren't (industrial fires, pollution, dam collapses, nuclear bombings). But what makes them a disaster is how they intersect with individual and community vulnerability, which is socially constructed. Once we understand this fundamental paradigm, we can understand how disasters are political events with political causes and solutions, not just (or even not primarily) technical failures." "So to think about Puerto Rico, we can see how imperialism (which of course is wrapped up in white supremacy and capitalism) shapes both Puerto Ricans' vulnerability to the hurricane hazard and also the U.S. mainland's response to it. Puerto Rico has been suffering under the Orwellian-named PROMESA Act, which essentially created a federally appointed fiscal control board that ruled the island for the benefit of mainland bondholders, rather than for its citizens. This has been hollowing out the Puerto Rican state for several years and has made Puerto Rico less able to respond to things like hurricanes. And of course, after the disaster, we can see how Puerto Ricans' second-class citizenship—yes, U.S. citizens, but without representation in Congress or a vote for president—means they do not get full access to the American state when it comes to disaster relief." Please read and share. Your shares mean everything in terms of whether a piece gets read widely. NEW AT PACIFIC STANDARD: Ohio uses Down syndrome to attack reproductive rights. Ohio Republicans are the latest group to seize on Down syndrome as a wedge issue in the fight against reproductive choice. Senate Bill 164 would make it a felony for doctors to knowingly perform an abortion after a prenatal diagnosis of Down syndrome. A few things to make clear: I am the father of a 10-year-old with Down syndrome. Nobody has more concerns about the rights of people with Down syndrome than I do. Yet I stand unequivocally opposed to this bill. It will not help people with Down syndrome. Even assuming it survives legal challenge, it is unlikely to result in fewer abortions. What it will do, however, is criminalize speech between a woman and her doctor. It will intensify the very stigma that drives so many people to terminate otherwise wanted pregnancies after they receive a prenatal diagnosis. These bills piss me off. Image Description: A man in a Viking costume (chainmail, shield, helmet) with Swedish on his shield, translating to "Vikings against inappropriate use of runic script." This is what not leaving a blank space on which to allow Nazis to project hate looks like.